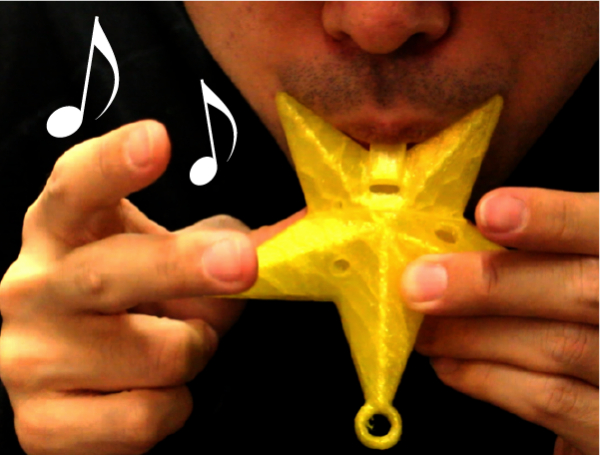 This paper presents an interactive design interface for three-dimensional free-form musical wind instruments. The sound of a wind instrument is governed by the acoustic resonance as a result of complicated interactions of sound waves and internal geometries of the instrument. Thus, creating an original free-form wind instrument by manual methods is a challenging problem. Our interface provides interactive sound simulation feedback as the user edits, allowing exploration of original wind instrument designs. Sound simulation of a three dimensional wind musical instrument is known to be computationally expensive. To overcome this problem, we present a novel fast resonance frequency prediction method based on the boundary element method. Specifically, we formulate the resonance problem as an minimum eigenvalue problem of a nonlinear matrix. Furthermore, we can efficiently compute an approximate resonance frequency using a new technique based on a generalized eigenvalue problem. The designs can be fabricated using a 3D printer, thus we call the results ``print-wind instruments" in association with woodwind instruments. We demonstrate our approach with examples of unconventional shapes performing familiar songs.